Because periodontal disease is a bacterial infection, periodontal bacteria can enter the blood stream and travel to major organs and begin new infections. The heart is one of the most susceptible organs.Several theories exist to explain the link between periodontal disease and heart disease. One theory is that oral bacteria can affect the heart when they enter the blood stream, attaching to fatty plaques in the coronary arteries (heart blood vessels) and contributing to clot formation. It is very important that you always provide your periodontist with a comprehensive and accurate medical history, including any problems you are aware of with your heart. 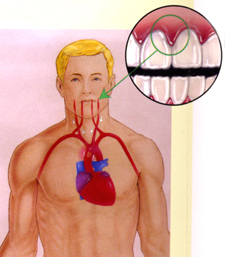 Some existing heart conditions such as a history of rheumatic fever, mitral valve prolapse or heart murmur may require antibiotics prior to dental procedures. Your periodontist and physician can work together to help you protect both your gums and your overall health.